With crisp evening air and a basket full of apples, fall whispers its entrance. I make a mad dash to preserve all that was summer with popping jars of hot tomatoes on my counter tops. Summer is nearly gone. The fall vegetables I now see bring relief. No canning involved in storing potatoes, beets, and my favorite – winter squash. You couldn’t talk me into eating these winter treasures for the first 23 years of my life. We now eat it in one form or another a few times a week during the cooler months. And everyone in our family – young and old – cannot get enough. If you’ve never been a fan of squash, then let me tell you a little secret: squash can be absolutely delicious, versatile, useful, and healthy, you just have to know how to use it. Look for clean, thick skin with no scuffs or blemishes. For the squash to keep well you want a piece of the vine to still be attached and the skin should not give when pressed. There are many types of winter squash, all with different flavors and textures. Here’s a run down of the ones you’re most likely to come across. Acorn – To my tastes this acorn-shaped variety has a vague squash flavor with very little sweetness. I prefer it in combination with other ingredients instead of as a stand alone dish. Butternut – With a cream-colored skin and orange, sweet flesh it is versatile and easy to find. Works well on its own or in combination with other ingredients. Buttercup – A round, green variety with a blueish bulge at the bottom. 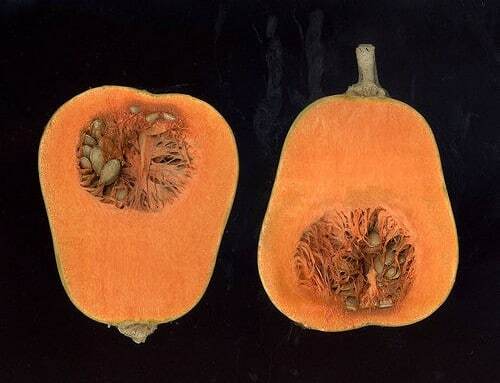 It is similar in sweetness to butternut, but with a more dense flesh. Spaghetti – A yellow, oblong variety that is used like pasta, as it’s name suggests. Very light on squash-flavor means it works well with robust sauces. Perfect if you’re restricting your carbohydrate intake. Delicata – A yellow speckled oblong variety similar to butternut in flavor, but with a lighter color. Carnival – Similar in shape to an acorn squash and similar in color to a delicata. I find this variety sweet and dense. Kabocha – A green or orange round squash, similar in appearance to a buttercup but without the bulge on the bottom. Kabocha means pumpkin in Japanese and shares the dense texture to the pumpkins we know. It is sweet and delicious – my favorite variety. Hubbard – A large blueish variety with an orange flesh. I find the larger ones can be too watery and prefer the denser flesh of the smaller hubbards. Pumpkin – This familiar fall standby is actually quite delicious, but not the variety that many carve up in October. 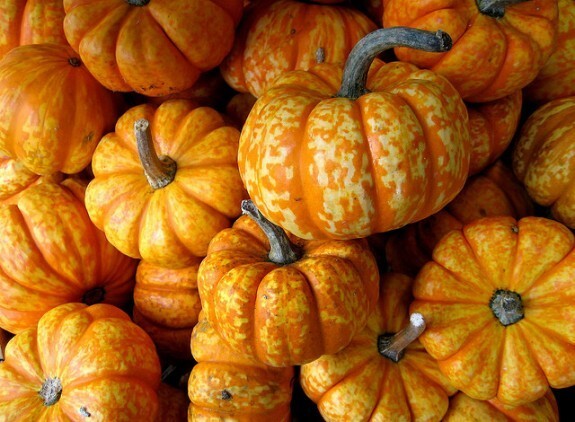 The smaller “sugar” pumpkins have a denser, sweeter, flesh and make a delicious pie. In my dream world we would all have a root cellar. We are renters, however, and we attempt common sense eating. That means we eat Asparagus in April, strawberries in June and squash in December. The great thing about winter squash is that even without a root cellar you can store it for months. All you need is some space in a cool room. I stored dozens of winter squash from October through spring last year and all it took was a bit of space in our unheated extra bedroom. I think we had a 95% storage success rate! 1. Create a flat surface. Slice off a thin layer of the bottom or sides in order to create a flat surface. This will ensure that it won’t roll around as you cut into it. 2. Peel. Unless you have a super peeler you’ll want to use your chef’s knife to thinly peel the skin while you prop it up on it’s now flat bottom. 3. Cut it in half. This will seem difficult the first time. It is best to keep your hands out of the way of the knife and put some weight on the top of the knife as you cut through. 4. De-seed. Use a spoon to remove the seeds and stringy innards of the squash. Squash is a sweet vegetable similar to carrots and beets. The best way to accentuate it’s delicious flavor is to cook it at a high heat and allow it to caramelize. A lot of tutorials tell you to add water, but I find that this simply waters down the final product. Squash can be used either as a side dish or a main event, such as an Autumn Millet and Squash Bake, (my favorite!) Also, just because a recipe calls for butternut, don’t be afraid to try one of the similarly flavored squashes listed above. The options are endlessly delicious, but we most often eat it simply roasted with grass-fed butter as a side dish in place of grains, potatoes, or bread. After preparing your squash (without peeling) lay it skin side down on a baking sheet. Bake for 45-60 minutes, or until a knife easily pierces through the largest part of the squash. Remove pan and allow to cool enough to handle. Scoop out flesh and mash with butter and sea salt. Enjoy. 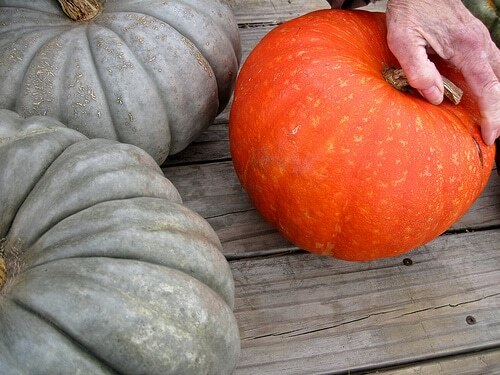 How about you… are you looking forward to winter squash as much as I am? Thanks for the great rundown on squash! I generally think of them as decor! I’m definitely going to give this recipe a try! Thanks Aimée! Melissa – So glad you’re going to give it a try. I love acorn squash the best! My favorite way to cook it is cut in half with a little butter and brown sugar in the center cavity. Bake it covered with aluminum foil and it comes out moist and fantastic! That cures the lack of sweetness problem with acorn squash too. Making me drool just thinking of it…. I am definitely looking forward to Winter squash as much as you, Shannon! I might have even let out a girlish squeal when I saw the title of the blog post. My favorite way to prepare butternut or acorn squash is halved roasted in the over with butter and brown sugar at 350 F for an hour. Yum, Kara! (and Trudy, above) I also like using foil to keep the squash nice and moist. I’m going to try using foil next time I make squash. It sounds like a good technique. This is an awesome tutorial on squash. Love all the photos too! Do you have to peel them? I’ve always left them unpeeled and scooped out the flesh when it was done. If peeling offers an advantage, I’ll do the extra work.. just don’t know what the advantage is? Erin – I never peel when I am going to scoop the flesh out. That’s what makes it such an easy dish. I love winter squash, but I was so distracted by the grammatical errors in this post that I had to comment. “It’s” is a contraction of the words “it is”. I read “Works well on it’s own” as “Works well on it is own”, which does not make sense. Good grammar does still count for something in this day and age, as evidenced by the fact that bad grammar is distracting. Doh! Thanks for the head’s up on this one. My coffee must not have kicked in yesterday! Woops! I remember proof-reading and thinking I needed to change that, but apparently I never got to it. So sorry. Thanks so much for this info. I have not tried winter squash because I didn’t really know what to do with it. I especially love the list of the different types of squash. Thanks again. Paula – I hope you enjoy your adventures with squash! I love this post! We are growing 3 varieties of winter squash this year for storage! Lovely, Jenn! What kinds are you growing and can you tell us how you plan to store them? Jenn – Do tell – what varieties? We grew kabocha this year but again did not get a great yield – maybe 6 or 7 off of our five plants. I’d love to see a post on how you grow it if you’re getting good yields. I just bought a spaghetti squash no more than 30 minutes ago! Girl…I’m starting to believe you can read my mind! Thanks for the post! Please also provide the guidelines for storing them (temp? light/dark?) Would an unheated garage in south Texas work? Liz – Squash like a warmer temperature (55-70 degrees), dry conditions, and should keep 4-6 months when cared for properly. Shannon, Thank you so much for the info about storing squash! What does one do to care for it properly? Should the squash be stored with space between them, piled up in a box, does that matter? We don’t have any unheated indoor space, so I’m thinking of creating that effect by putting the squash in a cooler or making an insulated box to keep them cool. Thanks for the inspiration! To be more specific: when you say “dry” conditions, would you take humidity levels into consideration? Or, are we talking actual dampness? I think that temperature-wise, my central Texas temps should be okay from late October to early March, but our humidity is still rather high compared with other areas. Trina – Humidity counts too. We use a humidity monitor to keep things in check. We also have a dehumidifier that we run in the winter in various places in our home just to make sure mold doesn’t occur. Thanks, Shannon! That definitely gives me a much better idea of how I can store without needing to can and freeze so much of it. Thank you!! I am not opposed to squash I have just really never done anything with them. Wanted to- but haven’t. This year I had already set out a goal to experiment and learn more about winter squash. You just helped me a ton. I would love to know some more recipes and such especially what you do with the pumpkin puree to save and add to pies, waffles, cookies, etc. This post will be my reference this winter on, thank you! Hi Mary- we’ll have a tutorial on homemade pumpkin puree coming up, so stay tuned! Thanks for the great tips! I was just looking for butternut squash soup recipes this morning. I always hate squash as a kid too but I think that was just because my parents didn’t know how to cook it right and never bought it fresh. You have to buy it fresh and prepare it correctly. Coincidence… I just dedicated today’s post to squash! I hope you will link up. I really like your method. I’ve prepared acorn squash quite a bit in the method you suggested, but I will have to branch out soon. Love the squash primer! I’m venturing into a winter csa this year, and I’m bookmarking this page for help! Thanks for talking squash! I look forward to autumn at my local farmers’ market (in Mountain View, California) because the winter squash appears alongside the summer corn, tomatoes, and zucchini (which I have found go well together in soup). So glad that you and I agree that Kabocha is amazing (extra sweet with deep orange meat). Because of its dry, dense texture, Kabocha can stand on its own as a side dish like mashed potatoes—in fact, try mashing the scooped out squash with a bit of olive oil (or butter) and roasted garlic (you can roast the garlic in the oven along with the squash). I also love Delicata—the ones my favorite farmer grows have flesh that is exceedingly sweet, medium yellow in color, and moist in texture. I know many farmers’ market shoppers who hoard Delicata because they cannot bear to be without it all winter long. I cook and scoop out, then eat the Delicata flesh as is or infuse the broth of soups with its subtle sweetness (the Delicata flesh is not dense like Kabocha or Butternut, so it disintegrates into the soup broth, adding flavor and nutrients). One additional tip for selecting a squash: Think heavy. In my experience, the heavier the squash, the more flesh (instead of just seeds and skin). You can also prepare winter squash in the MICROWAVE. Pierce the whole squash in several places, put into a microwave-safe dish, and microwave uncovered for 3 to 4 minutes. Turn the squash over, and microwave for another 2 to 3 minutes. Keep turning and microwaving until the squash is shiny and soft all over. Cut in half and let cool. When you can, scoop out the seeds and enjoy! I never, ever, cut up a squash. It’s so much work, and the flavours really intensify when you bake it. I like to season mine with a bit of curry powder before baking, or if you prefer something a little milder, just some coriander and cumin seeds ground (and salt and pepper of course. Perfect for making soup too, one of my fall favourites. Oh and don’t forget you can toast the seeds, the same way you can with pumpkin seeds, once you clean off all the membranes. Just toss with a bit of vegetable oil, season (salt, pepper) and bake on a cookie sheet at 350F until crisp. Thank you for this! My mom never prepared anything besides basic veggies (corn, peas, carrots) so there are many I would love to try and have my kids try. I will be awaiting further articles. As far as storing, I have a basement, do I need to do anything special to the squash or do I just put on a shelf down there? This is one of the best articles in details I have read about the winter squashes! Thanks. I did not knew Hubbard and Kabocha squash variety at all. Maybe next time, I am shopping in farmer’s market, I will ask around. I get to try new food that way! I put my indian twist on it…. Fry together some finely sliced onions, 1 tsp fresh garlic . When onions softened add a touch of tumeric, salt, half tsp coriander powder and 3/4 tsp cumin (jeera) powder. Then add winter squash. Cook on a low medium heat so as not to burn it. Can add a tbsp water so the spices won’t be powdery. But quite rightly said in an earlier post, it does water down. When soft but not too squishy you can serve and garnish with fresh coriander.